Scientists from Melbourne’s Walter and Eliza Hall Institute and the RIKEN Institute, Japan, have found that type 2 diabetes could be ‘reversed’ in laboratory models by dampening the inflammatory responses in fat tissue. 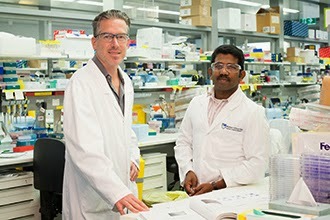 In the recently published article in Nature Immunology, Dr Ajith Vasanthakumar, Dr Axel Kallies and colleagues have reported that the regulatory T cells (Tregs) play a key role in controlling inflammation in fat tissue and maintaining insulin sensitivity and have published their findings in Nature Immunology1. Type 2 diabetes is the most common type of diabetes with an alarming rise in the prevalence rate. It is strongly linked with ‘lifestyle’ factors, such as being obese or having hypertension and its long-term complications include kidney, eye and heart disease, and there is no cure. People with type 2 diabetes have reduced sensitivity to insulin, a hormone that normally triggers uptake of glucose by cells, and their cells no longer respond to insulin appropriately. This decrease in insulin sensitivity is thought to be a result of long-term, low-level inflammation of fat tissue in people who are obese. According to Dr Vasanthakumar, Tregs act as the guardians of the immune system, preventing the immune response from getting out-of-hand and attacking the body’s own tissues and when the number of Treg is reduced, it leads to inflammatory diseases such as diabetes and rheumatoid arthritis. Recent studies have demonstrated that fat tissue has its own unique type of Tregs, which disappear from fat tissue during obesity. This study has showed that the fat tissue of obese people has lower numbers of Tregs than the fat tissue of people in a healthy weight range. Without Tregs, the inflammation-causing cell levels increase, and this rise in inflammation can lead to insulin resistance and high blood glucose levels, a classic hallmark of type 2 diabetes. The researchers have discovered a key hormone called IL-33 (interleukin-33), which was able to selectively boost Treg populations in fat tissue, effectively halting the development of type 2 diabetes, or even reversing the disease in preclinical models. Treatments that mimic IL-33 could have the potential to reduce obesity-related inflammation and type 2 diabetes. The findings of this research underscore the importance of ‘healthy’ fat tissue in maintaining a healthy body, rather than being thought as simply being an energy storage reservoir. Fat tissue is increasingly being recognized as an important organ that releases hormones and regulates development.